The sQuba was designed and built by Frank M. Rinderknecht, the founder and CEO of Rinspeed (Switzerland), 30 years after the James Bond thriller The Spy Who Loved Me. However, the car known as Wet Nellie¹ that was driven underwater by Roger Moore was a film prop. 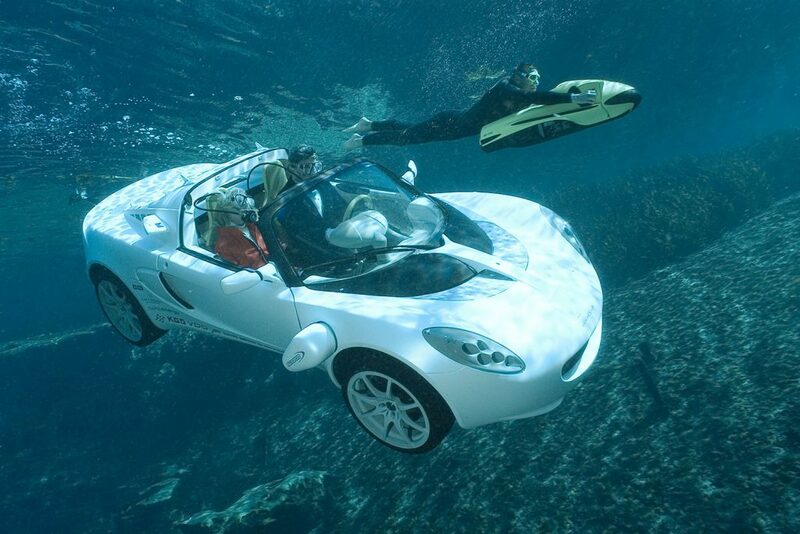 Launched in 2008, the sQuba is a real car that flies at a depth of 10 m (33 ft) underwater. To do so, its combustion engine was removed and replaced by several electric motors. Three motors are located in the rear. One provides propulsion on land, the other two drive the screws for underwater motoring. They are supported by two powerful Seabob jet drives in the front, which ‘breathe’ through special rotating louvers from HS Genion (for opening and closing the water intake). Power is supplied by rechargeable Lithium-Ion batteries. ¹ Wet Nellie is now owned by business magnate, investor, engineer, and inventor, Elon Musk, who bought the vehicle for £550,000 at auction in 2013. Musk has announced that he plans to convert Wet Nellie into a functioning version of the submersible car from the Bond film, and that it will be powered by Tesla Motors’ electric drive train. “It was amazing as a little kid in South Africa to watch James Bond in The Spy Who Loved Me drive his Lotus Esprit off a pier, press a button and have it transform into a submarine underwater. I was disappointed to learn that it can’t actually transform. What I’m going to do is upgrade it with a Tesla electric powertrain and try to make it transform for real.” — Elon Musk, after buying Wet Nellie in 2013. USA Today, Tesla’s Elon Musk buys 007’s sub to make it real, Chris Woodyard, October 18, 2013.